I am back with Lemon Rice! Have you ever felt that time is running so fast? I did, recently. My 1 month vacation is over in a blink! Wow! Going on vacation is real fun and that too when you go to your native place to meet your family and friends. Nothing can equal this joy. I had a great time in India. Ate all my favourite dishes and spent time with my family. Jeez! I miss them. Though the travel time is nearly 22hrs, I managed to sleep most of the time so that I can avoid Jet lag. Visited Tirupathi and attended few functions and now I am sitting in my new apt cherishing all my memories. Yes I am Back! We shifted to a new apartment and now I have to get accustomed to this new environment and set things. You may ask, what did you cook so soon with nothing much in your kitchen? Of course, the all time saver, Lemon Rice. This is the most easiest recipe I have ever come across, of course next to curd rice. 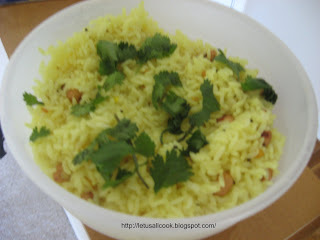 I have tasted lemon rice in many of my friends and relatives place, but only few recipes lure me to eat them more.I am sharing my favourite lemon rice recipe which makes me eat more lemon rice even when I am on a diet. Preparation time is 30 mts. This time is just to cook the rice, all the other preparation takes less than 5mts. For a beginner, I would suggest you to do this dish more carefully, as even a minute mistake will spoil the taste of this dish. 1 Lemon for taking lemon juice or you can also use the Lemon squash that you get in shop. But fresh lemon juice adds a lot of flavour and aroma to this recipe. 1 cup Rice (You can go for either basmati rice or your normal rice). If you do this recipe more often I would suggest you to go with the normal rice as more intake of basmati rice is not that good for health. In Rice cooker, cook the rice with the required amount of water. In a pan, add some oil, mustard seeds. When the seeds pops, add hing, urad dal, channa dal and saute them. Add Green chillies, turmeric powder and ginger and saute them for few seconds. After the rice is cooked, cool it for few minutes. Add the mixture from the pan and mix well. Add the lemon juice, salt, ground and cashew nuts and mix well. Garnish it with cilantro and serve with papad or any of your favourite side dish. There are many other ways of preparing this lemon rice, but this is my favourite way. Back already..Hope you had a balst .Lemon rice sure is perfect after a long vacation.. Lemon rice thats my all time tasty food you can't beat this variety rice. Looks like u had blast in India. Welcome back. I often make lemon rice. It's not only delicious but so simple to make! Welcome back :)) lemon rice looks gooood!!!! its all time tasty food. Lemin rice is my favourite. whenever I have cooked rice I prefer to make this. good one. Lemon Rice any time is welcomed with a smile :) Welcome back Sangeeth. Btw I have sent you an entry for the protein rich event.